11/1 NHL Accumulator & Double land on Wednesday night! Another day, another winner here at FST!! After our tipsters landed a 16/1 NBA Accumulator and double last night, we have woken up to yet another accumulator winner! This time around it was our NHL tipster who successfully landed a 4-fold priced at 11/1. His double also came in to increase our winnings overnight!! The Accumulator started with the Toronto Maple Leafs and Buffalo Sabres squaring off in the first game. Buffalo led after the first period, but that didn’t discourage Toronto who we backed to win here. They turned it around quickly in the 2nd period and in the third they capped off the win with two more goals for a final score of 4-2. Tampa Bay required Overtime in the 2nd game of the Acca to take care of business against the Washington Capitals. Just like in the first game, our team was losing 1-0 after the first period, but Tampa fought back with a 4-2 scoreline in the 2nd to take the lead. Washington levelled it in the 3rd period and we went into Overtime as the game ended 4:4. Victor Hedman scored 3:01 into overtime to give Tampa Bay it’s 6th win in a row as they continue to dominate the regular season! It was a high scoring game between the Vancouver Canucks and Ottawa Senators. We backed Vancouver -1,5 Puck Line here and they went off to a hot start leading 4:0 after the first 40 mins. The winner was pretty much decided after that and both teams opened up in the final period which ended 4:3 in favour of Ottawa for a final score of 7-4 Canucks which meant we were down to one last team on our Acca! That team was the Winnipeg Jets who faced the Anaheim Ducks. Earlier in the season the Jets beat the Ducks already twice so we were very confident they could sweep the season series here and they did just that. An easy 3-0 win for the Jets gave them their 3rd win over the Ducks in the regular season and successfully landed our 11/1 acca on the night! 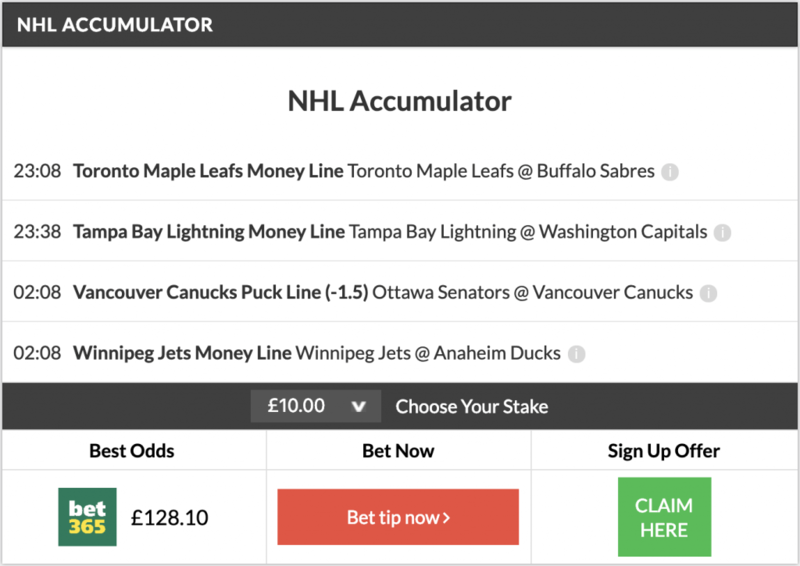 Our FREE NHL TIPS page features Accumulators, Mega Accumulators, Doubles and Bet of the Day tips! They go live around 6 pm every single day! Be sure to follow! Categories: Blog, NHL, and Tip Results. Sports: NHL.